Super Mario Bros. Notecards | Nerd Much? If you’re looking to put a smile on your gamer friends’ faces, send them a dose of nostalgia with these officially-licensed Super Mario Bros notecards. 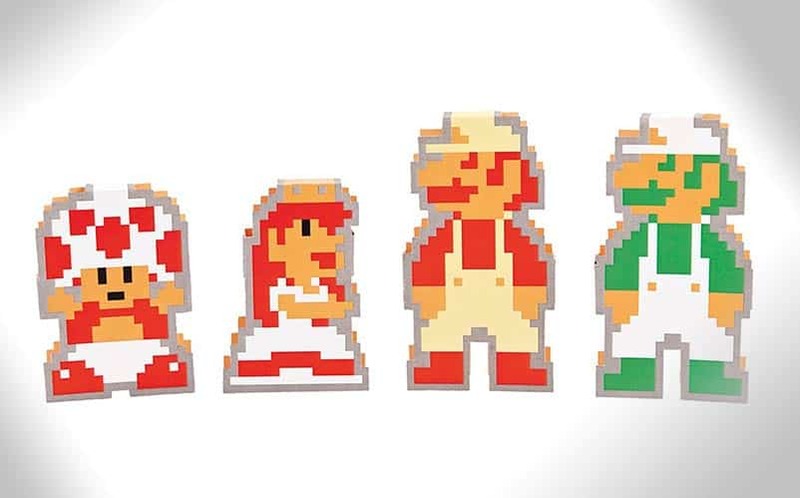 Each 12-pack contains likenesses of the original 8-bit characters (Mario, Luigi, Toad, and Princess Peach) from the 1985 Nintendo title Super Mario Brothers. The die-cut characters fold flat for easy mailing in the included Mario-themed envelopes but fold into self-standing characters so the recipient can display them proudly. They even come in a sturdy, attractive box that also features awesome vintage, pixelated graphics. With a blank inside to write your own custom message, you don’t need a special occasion to send them — they are perfect just because. Best of all, they are reasonably priced at less than $13. So let the retro gamer in your life know that you are thinking of them with these awesomely nerdy cards. Or, better keep them for yourself and arrange them on your mantle; we won’t judge you. For more cool nerd stuff to buy, stay tuned to Nerd Much for daily updates and fun finds.